So its 2015 now. When can we expect to hear announcements of US shows this year? I would imagine they would want to make these announcements timely so that people can plan ahead to attend. I had planned to see TD when they had their smaller, somewhat troubled US tour a few years back. It was my first real chance to see them live, given they had not played the US in years and had even those rare US dates were nowhere near me. Well, things happen and I didn't get to see any of those shows. So, here comes Moogfest. 2 hours from me. Perfect, now finally my 30 + year dream of seeing TD in concert would come true. Again...things happen. After all these years, Tangerine Dream plays a concert so close to my hometown but, due to a few small issues ( all of which could have been easily resolved, all it would have taken was a little bit of annoyance to handle a few things ), the show came and went without me. And now I do regret not seeing those recent concerts. 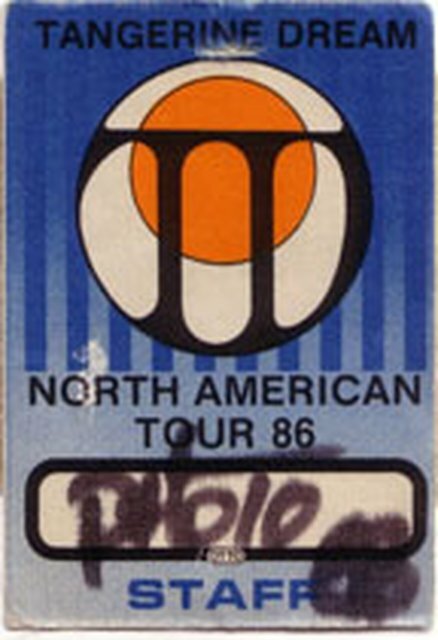 And I even those who had the magical opportunity to see TD in concert. I also feel a deep sense of regret not seeing them the last time they came to the US in 2012. The venues they chose were so remote, and even though I did not mind flying to California, the venues were quite distant from LAX to the point where I would have had to either rent a car or book some other form of expensive transportation for an hour long commute to and from the venue. Including flight tickets and hotel accommodations, this would have been well over $500, which is something I just cannot afford with my meager student salary. I had planned to see them play in 2014 when they were supposed to play some US dates. That got pushed back to 2015 and I was even more determined to see them this year. It was literally one of my new year's resolutions. I never got the chance and it hurts so bad. I can only hope that there is some kind of tribute show put on in the US by the remaining members of the band and possibly Jerome. There would be a huge amount of interest in such a show. I have no doubt any such shows and the release of unreleased albums will be of great financial support to Edgar's family. And at this point I feel like we all need to show as much support as possible towards his family. Never say never. That's what I said back in 2008. I have been working for a US airline since 1996. And I've been following my favorite band, Tangerine Dream since 1978. I never got to see them perform back when it was Tangerine Dream for me. The military came into play from 1983 till 1990. I finally got to see them live here in the LA/OC area twice in 1992. San Juan Capistrano and Los Angeles. Not the Tangerine Dream that I would of liked to see "live" but never the less it was TD. Lost touch with the Dream for awhile during the mid 90's till 2003 or so. I started to liking their music again and had several opportunities to fly to Europe to catch one of their performances. Never did till 2008. I figured theres going to be a time when Edgar call's it quits. Well I missed an opportunity to see the Loreley concert with Klaus Schulze so when they announced the London Eye concert I made the arrangements and flew over for my first abroad concert. And I am glad I did. After Edgar's health became an issue I flew over every year to see them perform at least 1 concert a year. Except for 2011. I almost flew to Melbourne to see the new Quantum line up. Now I wish I did. At least I can say I saw the Dream live more than once. If I could only fix my time machine so I can go back to the mid 70's to see one of the live improvised gigs.